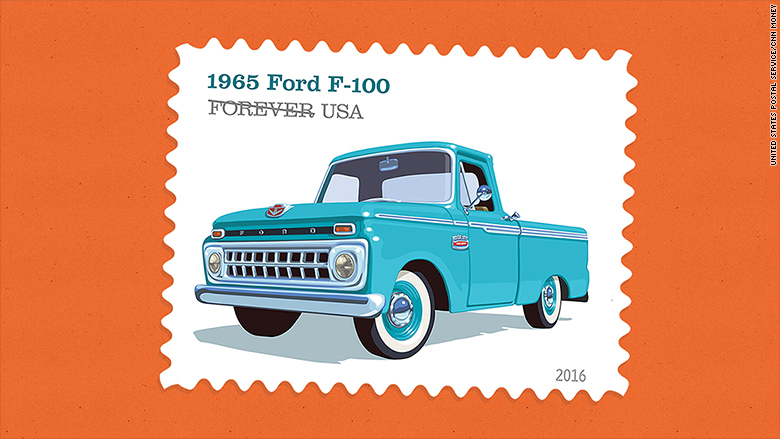 The Ford F-100, precursor to today's F-150, is one of the trucks honored by the U.S.Postal Service in its new series of pickup truck stamps. This version of the Ford truck had independent front suspension for a more comfortable ride. 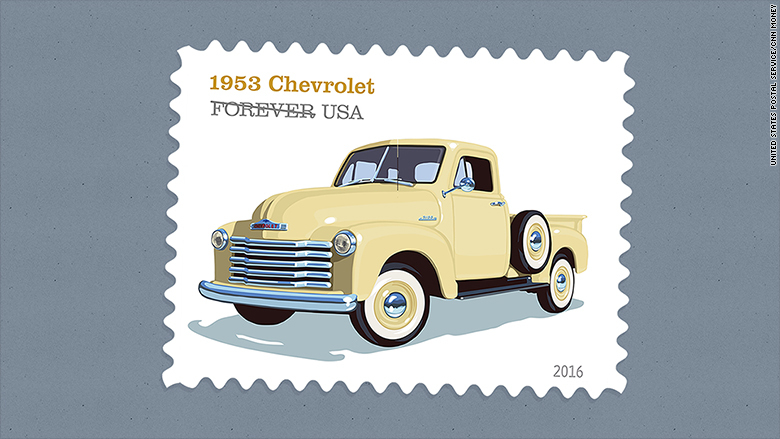 It's been a part of the rural American landscape for decades and, now, the pickup truck is finally getting honored with a postage stamp. Four of them, actually. 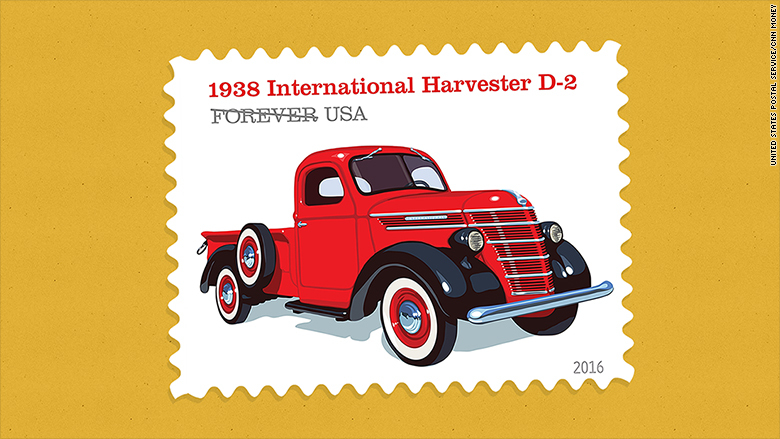 The United States Postal Service's pickup stamps will feature four classic American trucks: the 1938 International Harvester D-2, the 1953 Chevrolet pickup, a 1948 Ford F-1 and a 1965 Ford F-100. Each will be illustrated on a "Forever" postage stamp. "For the significant contributions pickup trucks have made in molding this country's landscape and revolutionizing how we transport ourselves and our goods, we proudly honor these four iconic trucks," USPS Executive Vice President Jeff Williamson said in a statement. The earliest pickup-style vehicles modified passenger cars with their back seats removed and replaced with flat cargo beds. Before long, in the early 1900s, automakers were building pickup trucks at the factory. You could buy a Ford pickup as early as 1905, before the Model T was even available. One of Chevrolet's "Advance-Design" trucks, the 1953 model featured a distinctive bulging grill. It was pickup variants of the popular Model T that really cemented the truck's role as America's workhorse. Before long, they were a crucial part of the American auto business. Today, the most popular vehicles in America, by sales volume, are pickups led by the Ford (F) F-series and General Motors (GM)' Chevrolet Silverado and GMC Sierra. Japanese automakers like Toyota (TM), Nissan (NSANF) and Honda (HMC) are also competing in the pickup market. Ford's first post-war pickup came out even before its first post-war car. The F-1 marked the beginning of the famous F-series. The root of the term "pickup" isn't really known. You can pick things up with a car, a van or a box truck, too, but, for some reason, the name has become attached to just this type of vehicle, ones with an enclosed cabin for occupants and an open bed for cargo. International Harvester, mostly known for agrcultural equipment, launched its D-line of pickups in the 1930s. The strong sturdy trucks featured a striking futuristic design. 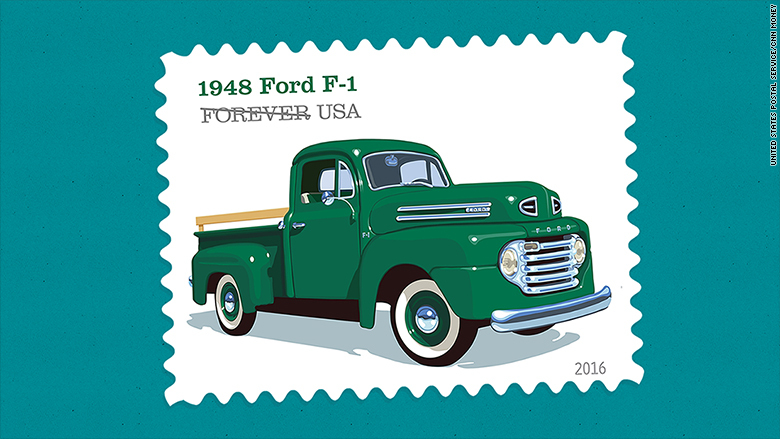 This isn't the first time the postal service has honored vehicles on stamps. The postal service has issued Muscle car stamps, featuring cars like the Shelby GT500 and the 1969 Dodge Charger Daytona, motorcycle stamps, hot rod stamps and American sports cars stamps.